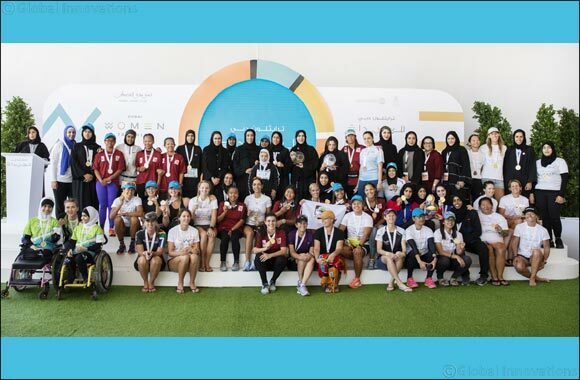 Dubai, UAE, November 10, 2018: Her Excellency Hessa bint Essa Buhumaid, UAE’s Minister of Community Development, saluted the spirit of the contestants in the second Dubai Women’s Triathlon after presenting the winners with their medals. Irishwoman Deirdre Casey, a veteran of more than 50 triathlons, took the top honours in the Olympic Standard race with a time of 02:07:42, Great Britain’s Helen O’Neile clocked 01:11:28 to top the charts in the Sprint Race, while Venezuela’sJoselyn Brea was fastest in the Super Sprint Open Category with a time of 35:42. In the Super Sprint race for Emirati nationals, Wafa Hasher finished first. “I am really pleased to see so many participants of different nationalities take part,” said H.E. Hessa bint Essa Buhumaid. “Their enthusiasm is really infectious and I am confident that in the years to come, this event will become one of the best with a great number of participants. H.E. Saeed Hareb, Secretary General of Dubai Sports Council, was also present at the awards ceremony along with H.E. Mona Al Marri, Chairperson of the Board of Directors and Managing Director of Dubai Women’s Establishment, Hala Youssef Badri, Vice President of Dubai Women’s Establishment, Moza Al Marri, Board member of Dubai Sports Council and Chairperson of DSC’s Women’s Sports Committee, and Lamia Abdulaziz Khan, Chairperson of the Organising Committee, Vice Chairperson of DSC’s Women’s Sports Committee and Director of Dubai Ladies Club. The organising committee will donate all the proceeds from the event to Al Jalila Foundation’s iMcan programme to help women who have lost their limbs get prosthesis. “The increase in the number of participants for this second edition of Dubai Women’s Triathlon reflects the growing interest of women in the UAE to take part in sports competitions and lead a physically active lifestyle,” said Lamia Khan. National Category 30-99:1-Wafa Hasher 01:05:54; 2-Maytha Hasher 01:16:29. Open Category 16-29:1-Joselyn Brea (VEN) 0:35:42; 2-Sarra Lajnef (TUN) 0:39:15; 3-Lauren Agent (GBR) 0:40:41. Open Category 30-99:1-Kate Turney (GBR) 0:46:28; 2-Kristi McTague (NZL) 46:52; 3-Kate Hill (GBR) 47:12. Team - National Category:1-RTA (Fatima Al Blooshi, Shamma Al Shehhi, Suhaila Farooq) 0:50:17; 2-Munira Al Raeesi-Muna Al Salawi-Ayesha Al Mheiri 0:58:54; 3-Maha Hamad-Sana Ahmed-Alaa Ahmad 1:00:55. Team – Open Category:1-Immaculate Sanchez-Cindy Janoras-Amanda Da Silva 0:40:55; 2-Wee Mumma Vibes (Jane Matheson, Vicki Matheson) 0:44:38; 3-AGFE Superwomen (Nao Valentino; Nesma Farahat; Soraya Benchiba) 0:46:48. Age 16-29:1-Helen O’Neile (GBR) 01:11:28; Rachel Richardson (GBR) 01:22:12; Myka Luna (PHI) 01:29:22. Age 30-99:Leanne Carson (GBR) 01:18:43; Gemma Wright (GBR) 01:19:28; Therese Goodwin (GBR) 01:20:46. Teams:Chicks Who Try (Angela Jones, Karen Stewart, Michelle Mckechnie) 01:28:10; Mary Catapang-Maria Lozano-Cybelle Demellites 01:32:55; Just du it (Samya Chahin, Charlotte Rasmussen, Lara Ammoury) 01:32:58. Age 16-29:Lottie Lucas (GBR) 02:14:45; 2-Emilia Skolubowicz (POL) 02:29:38; 3-Ka Wai Lee (HKG) 02:47:54. Age 30-99:1-Deirdre Casey (IRL) 02:07:42; 2-Solange Agnelli (ARG) 02:21:44; 3-Inalize Oosthuizen (RSA) 02:29:22. Team:1-Carrot Catchers (Lisa Hancox, Jacqui Liebenberg, Azzurra Ministrini) 2:23:58; 2-Jurdith Lumbre-Catherine Mirasol-Latifa Essarokh 02:36:20; 3-Chicks Who Try II (Tracey Rowe, Hayley Bailey, Toni Greenwood) 03:06:46.